A native to Indio, California, Alexandria graduated from La Quinta High School, and from there attended Cal Poly San Luis Obispo where she received her Bachelor’s degree in Wine and Viticulture. She first became interested in a career in wine while on her initial college tour, where she learned the details of this unique major and didn’t realize the extent of the education one could receive in wine. Internships at J.Lohr Vineyards in Paso Robles and Viña Cobos in Mendoza, Argentina laid the foundation for her career as a wine educator. Alexandria’s background also includes sommelier of St. Supéry Estate Vineyards & Winery in Beverly Hills and Founder & Editor-In-Chief of Lady Somm – an online blog where she chronicles her journey as an aspiring winemaker and sommelier. At Morgan’s in the desert, Alexandria will share her wine expertise, tasting tips, and make recommendations for varietals. Guests and staff alike will enjoy exploring new vintages and discovering more about the intricacies of wine. 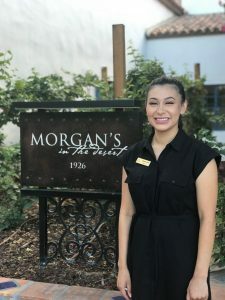 Alexandria also plans to build the wine list at Morgan’s, with the goal of Morgan’s being an essential stop for the growing number of wine aficionados in the valley. Alexandria’s personal favorite year-round wine is rosé, specifically the Domaine Le Pive Rosé that was just added to the Morgan’s wine list; she describes it as bright, crisp, and refreshing with a beautiful fruity nose, and states it is already quite popular among guests. However, when it comes to a favorite food and wine pairing, duck confit with a burgundy pinot noir is at the top of her list. To make a dinner reservation at Morgan’s in the desert call 760.564.7600.